Well, I guess I fell a day short of making an April post. It's been an interesting month and I've got a lot of new stuff to talk about. A few weeks ago, I traveled to my first ever PAX East. It was an amazing convention that even managed to make GDC feel empty. Got to attend some cool panels, meet some totally awesome indie developers in the expo hall, and tour a city I've never been to before. If there's one thing I noticed about Boston it's that its people sure love being there. It felt very patriotic and respectful towards this country's history. Of all the places I've been, I'd say Boston best represented the true "American city." Anyways, I'm getting off topic. PAX East was fantastic and I'm hoping to attend one of the other locations some time in the near future. 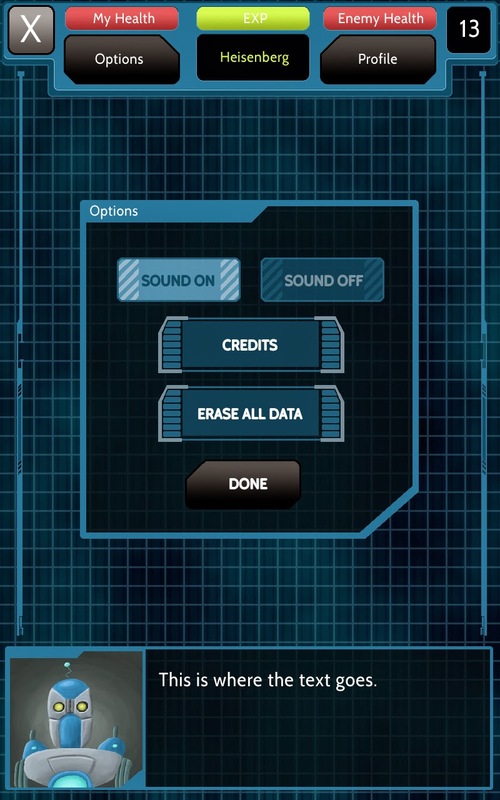 I've also been hard at work with the team at NotRobot on our upcoming mobile title Wave Crash. I've mainly been working on the UI / HUD, and things are starting to really come together. We will be entering beta any day now, so keep your eyes on the official website: Not Robot In addition to that, I've also worked on a couple of different projects to keep my skills sharp. 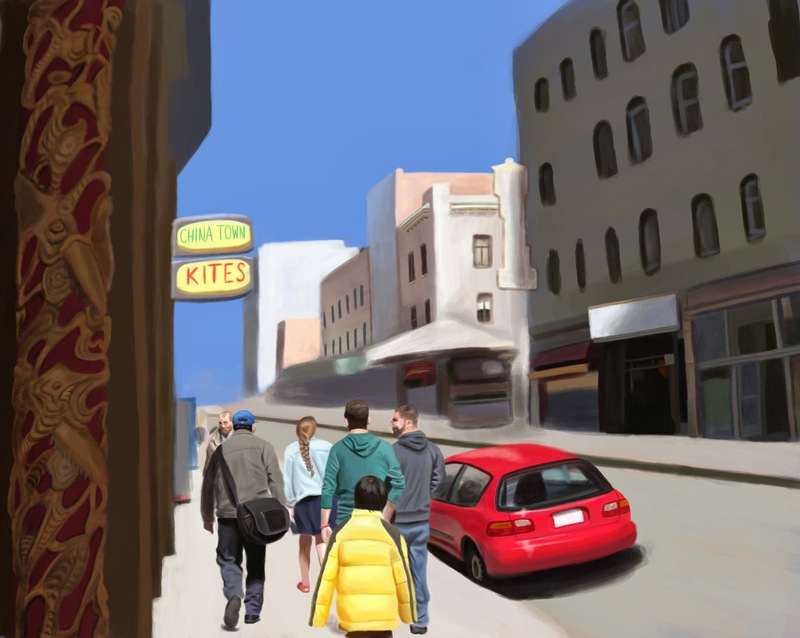 I finally finished my Chinatown painting from San Francisco. I ended up putting a lot more detail into this than I originally expected. I spent so many consecutive hours on this that my hand started to cramp up by the time I was finished! Overall though, I'm pretty happy with the results. I wish I had saved a copy before I detailed the pole on the left, but this still gives you a pretty good idea of my process. Blocked in everything from the start, and then focused on detailing individual sections one at a time. And finally at the end, I added in some of the top layer stuff like poles and hanging objects. 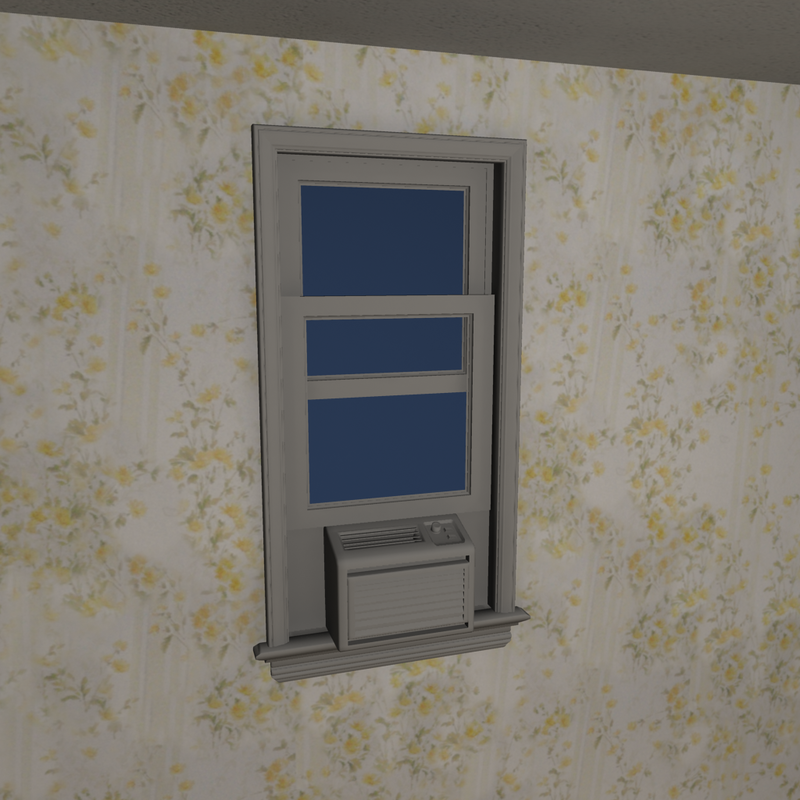 Also been working on my texturing skills a bit. I love painting textures by hand, but I know there is also a demand for super realistic textures that you can't really get by painting. So I decided to take inspiration from the amazing artists at Naughty Dog (like Genesis Prado) and try my hand at creating textures in ZBrush. 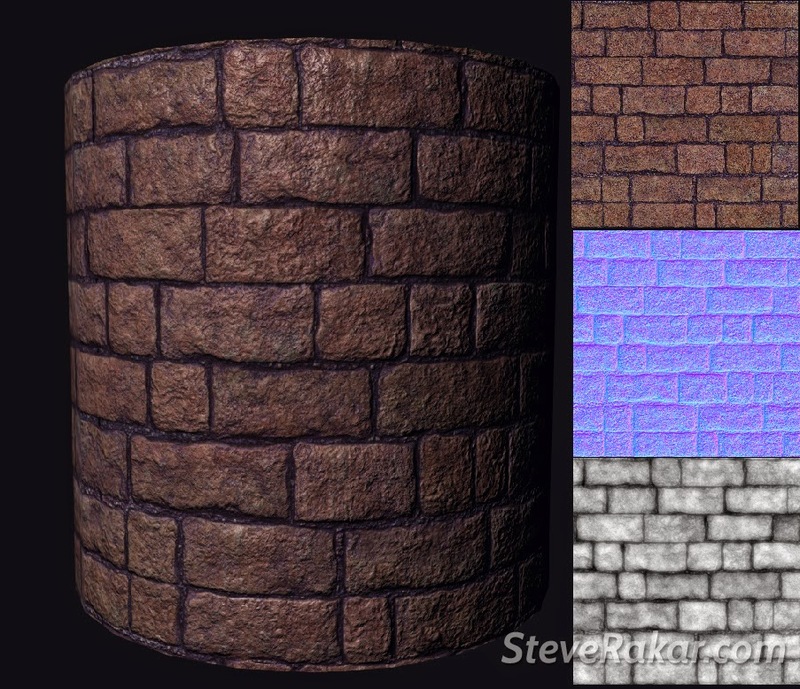 For this texture I started with an individual brick object and placed a bunch of them in a pattern. Exported a whole bunch of different channels and did some combining in Photoshop. I really like the way it came out and I'm eager to try this method again! Since I've pretty much made up my mind that environment art is my strong suit, I created this in my endless pursuit of adding more art to my portfolio. 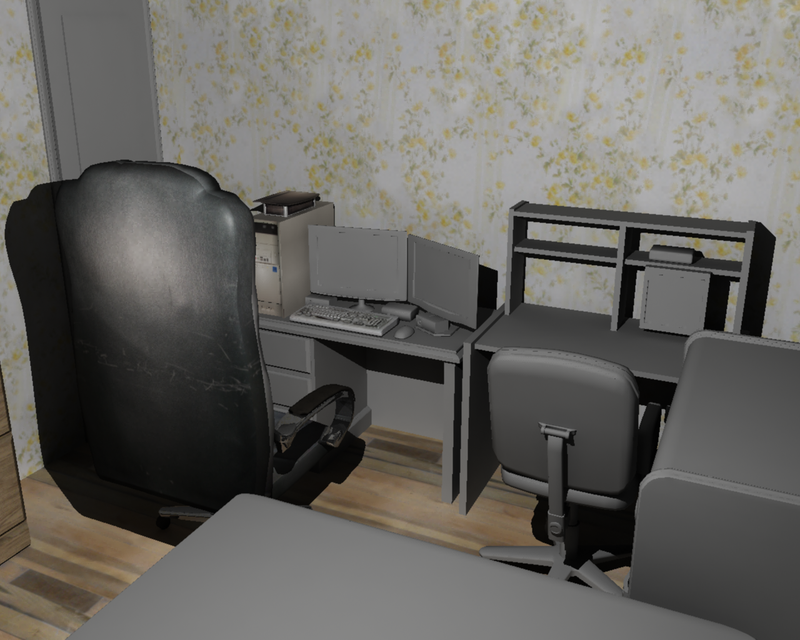 A lot of really good hard surface modelers seem to create these pristine living rooms with modern looking furniture. So I decided it would be fun to make one myself. I experimented with using VRay and its Sun&Sky system to get the rendering on this. This is just a simple living room shot, but right now I'm actually in the process of modeling out the entire house for my new demo reel. Hopefully I should have that done for the next post. This is just a quick little drawing I did when I was in the mood for something a bit cartoony. 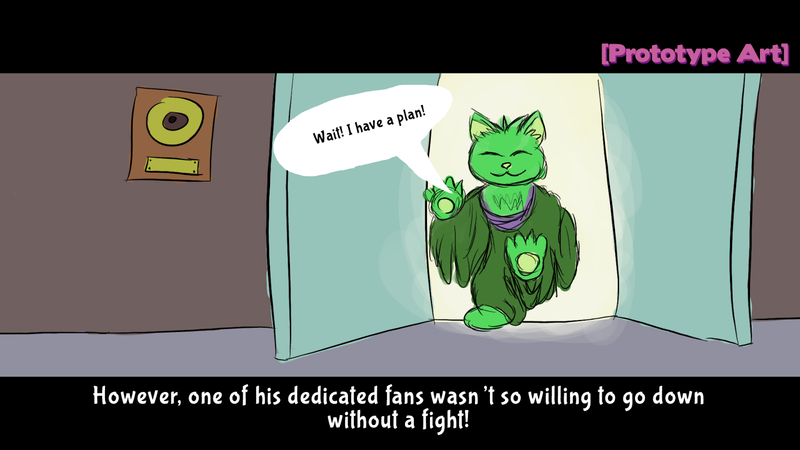 This is Cimc and Fuzzy, characters that my sister and I created a long time ago. And last but not least, this is a concept piece of a small mobile game I've been making in my free time. It's just a short parody game poking fun at some common themes in social gaming. The goal is for me to finish the entire game in a few weeks and get my feet wet in the Google Play store before releasing some of my bigger projects there. The working title is 'The RAM That Feeds' and it's about 40% done at this point. Look forward to an update on it in the near future. And with that, this pretty much sums up my month of April. Like I said, it's been a pretty crazy month but I've still managed to get quite a bit of art done. Got some exciting things on the horizon, so stay tuned. Hey guys. I've been doing a lot of traveling lately in order to get some feedback on Quest For Funk. Two weeks ago I showed off the game at GDC and last weekend I had the game on display at the Mini Maker Faire in downtown Cleveland. Quite a few people got their hands on the game during these events, and it was very insightful to be able to get some feedback on everything. Some people seemed to like it a lot, others simply scratched their head in confusion, but overall I think it was a fairly positive experience. At GDC, I actually entered the game into Pocket Gamer's Big Indie Pitch event, where I got to show off the prototype to a panel of judges, ranging from various game journalists to folks from Rovio. This was my first time really showing off any gameplay to anyone, so as expected it was messy and nerve-wracking. 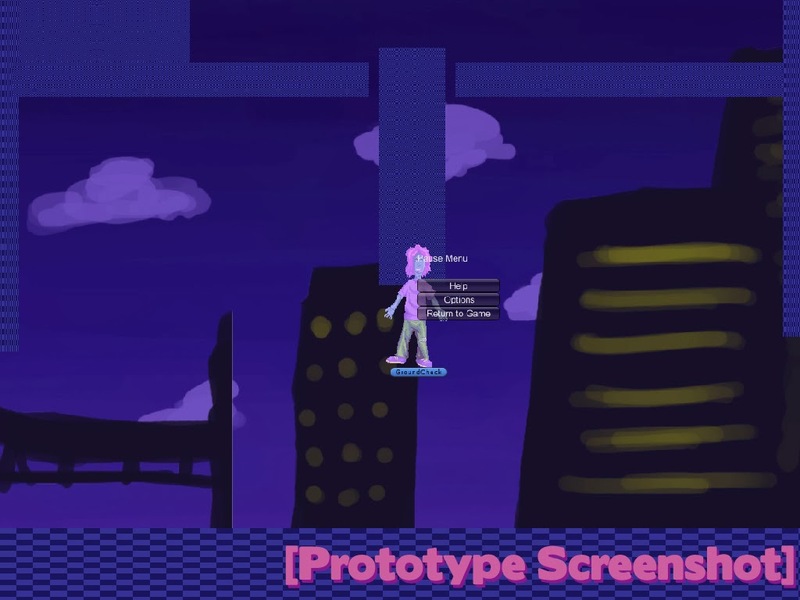 As you'd expect from a prototype, certain things broke and there was a lot of "well in the full game, this will be..." But I'm really happy that I presented the game in the stage that it was in. It opened my eyes to quite a few issues that I might have otherwise overlooked, and I think it will change the final product for the better. Here are some of the biggest takeaways that I learned. 1. The cross-genre gameplay might not work. When I explained the whole twinstick-shooter crossed with a 2D platformer idea, a lot of people nodded their heads but I could tell they were a bit confused. Even regardless of people's reactions, the gameplay sounded a bit ridiculous coming from my own mouth. I think the core flow of the game might be a bit more complicated than it needs to be, and I've been thinking of ways to amend that. 2. 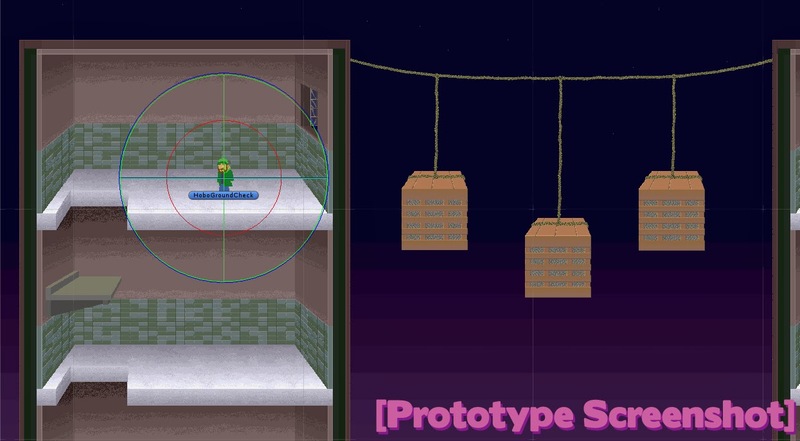 The platforming controls need to be reworked. A lot of folks seemed to have trouble navigating some of the sewer areas, especially the younger crowd that tried out the game. Something about the controls just doesn't feel as smooth as it should, and I think I need to research some good platforming games to get a better feel for how to fix this. In addition to that, the layout of the sewers could probably also use some work. Jumping from pipe to pipe in the current design is too difficult (especially once I throw touch screen controls in), so I might need to change up the layout. Wall jumping or being able to jump through the bottom of platforms are also possible solutions to this problem. 3. The art was fairly well received. Considering I'm an artist first and an everything else second, this one actually made me pretty happy. I got complements on the color palette and most people seemed to dig the character designs. A minor issue, but I need to make doors in the sewer area more obvious, because a lot of people had trouble locating them. Also EVERY SINGLE PERSON initially walked right past the ladder in the first room. There wasn't even ONE person who went up there before heading right. So I might need to make it a bit more obvious that you can climb up there. 4. The game is still pretty buggy in places. On numerous occasions, I encountered the bug where Dyll spawns backwards. This means he ends up running backwards for the entire game, which looks pretty sloppy. I thought I had fixed this issue, but there is clearly still a bug out there somewhere. Also I need to tighten up collisions because people often went in places that they weren't supposed to. Luckily no one made it to the very end of the stage because there is just an endless chasm over there that I was terrified someone would try to go to. 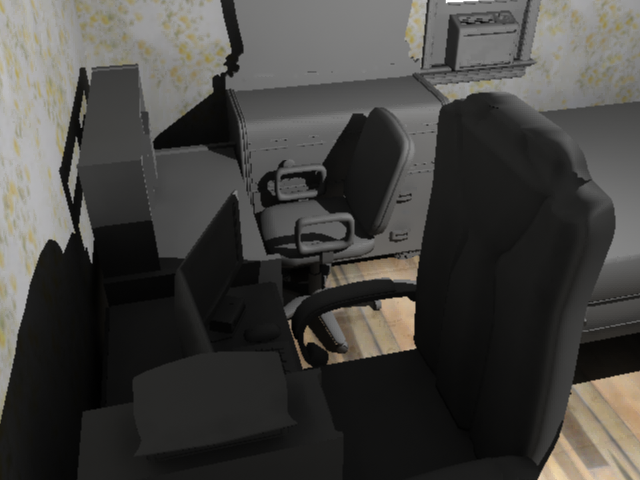 This is all pretty minor stuff, but it's things I wish I would have fixed before demoing the game. All-in-all though, I'm happy with the state of the game. I know what needs to be addressed, and now I'm fired up to make even more progress on the game. As a side note, the images you see throughout this post were last minute cutscene images I drew before leaving for GDC. I wanted to make sure the story was clear rather than just dropping the player in the level, so I threw them in there right before I left. They will all be replaced with proper artwork later, but for now they do a decent job of telling the story. Anyways, that's all I've got for you this time. Hopefully I'll have another update soon talking about how I fixed all of these new issues that I discovered. Until then... Adios! 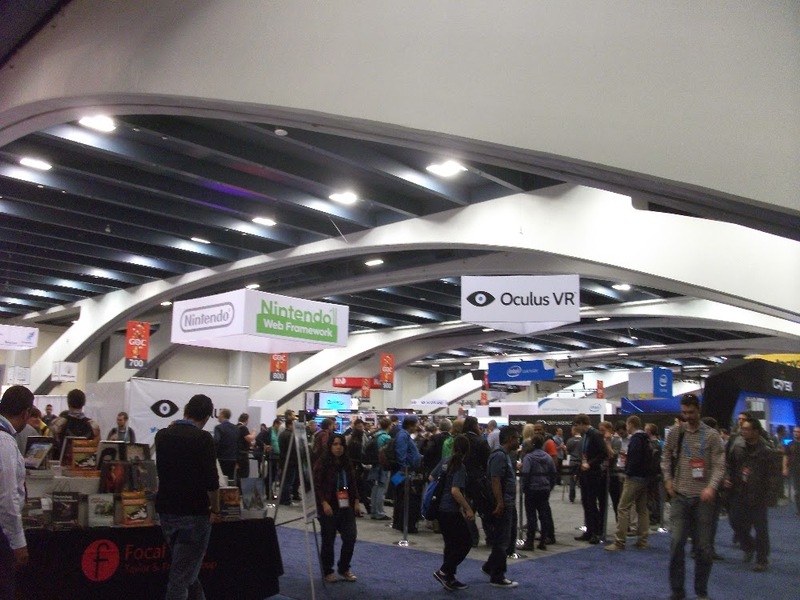 Last week I attended my first ever GDC in San Francisco. I had an amazing time and came away with a ton of really great new experiences. I realized my blog has pretty much been filled with Quest For Funk stuff lately, so I figured it would be a nice change of pace to write a post about my general experience at GDC. I do have a lot of Quest For Funk related news regarding GDC as well, but that will come in a separate post tomorrow. I spent 5 days in San Francisco, and man was it exhausting! I only bought an Expo Pass, but that gave me access to more than enough events to keep busy throughout the week. The first place I went when I got to the conference was the Career Center... and that was so big itself I didn't even realize there was a whole separate Expo Hall! I've been to quite a few conventions before, but the enormity of GDC completely blows the rest of them away! I don't know the exact number of exhibitors there but it's enough to make your head spin. While most of the major companies that you would expect had booths there, I noticed that there seemed to be a serious lack of Japanese developers in the hall. It's entirely possible that I somehow just missed them, but Square-Enix, Namco-Bandai, Konami, and Capcom all seemed to be lacking a presence in the Expo Hall. On the other hand, Nintendo surprisingly had a really cool booth. They were promoting Unity on the Wii-U with promises that there will be 50 upcoming games for the console developed in Unity! Spent quite a bit of time playing Ittle Dew there, which was a ton of fun. The Ouya booth was also very interesting. They had 4 couches set up in a square, and constantly swapped out the games being played in the middle. Got to check out a lot of neat indie games in there, but Toto Temple was definitely my favorite! Arena game with four players dashing around trying to capture the goat. Fast paced, competitive, chaotic - seems like the perfect recipe for a party game. And speaking of indie games, the IGF Pavilion was pretty much the place to be! Tons of super creative games, including Crypt of the Necrodancer - a topdown roguelike played entirely with a DDR pad. At one point a Towerfall Ascension tournament broke out, and I spotted Ashley and Anthony Burch (of HAWP fame) in the midst of the crowd. The atmosphere was just so laid back and fun that it really contrasted with the stuffy businessmen on the outer walls, with their ad software and payment infrastructures. That said, the IGF was probably my most visited part of the convention center. 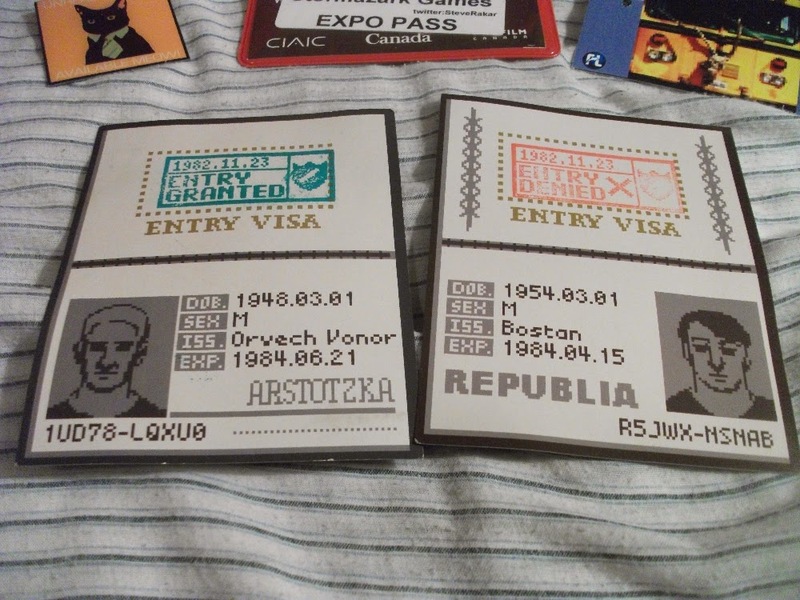 Even managed to score these awesome souvenirs from the Papers Please booth. In that this was a conference for developers, there was also a lot of cool news about game engines. Unity 5 was announced, and their presence there was huge! It's incredible how big the Unity engine is becoming, and I'm super excited how much easier they are making it for developers. I also got the chance to view a live demo of Unreal 4 in action. As a UDK enthusiast, I was overwhelmed! The new Blueprint system seems extremely powerful, and somehow it looked even easier to use than Kismet. The artist managed to create an entire Flappy Birds clone in-engine without writing a single line of code. Dynamic materials seem to be a big focus as well, which is enough to spark any budding artist's creativity. They set a ball on fire and then cooled it off with ice, going through a number of materials in the process. Words can't do it justice, but the transition was amazing! I can't wait to check it out (which you can do for just 20 bucks a month, btw). Went to a bunch of parties in addition to the conference itself, and I'll be honest, this was the real reason to go to GDC! Not just because the parties are fun (they are! ), but because you never know who'll you run into. Meeting someone sitting behind a booth is cool, but you don't really get to know someone until you share a drink with them inside a night club playing Tetris music. I met so many amazing people this week that I'm already anxious to go back and see them again next year. This is such an amazing industry and I'm so happy to be a part of it! Also, since this is an art blog, I don't want to rip you guys off with a post just full of text and touristy photos. So here's a digital painting I've been working on this week. 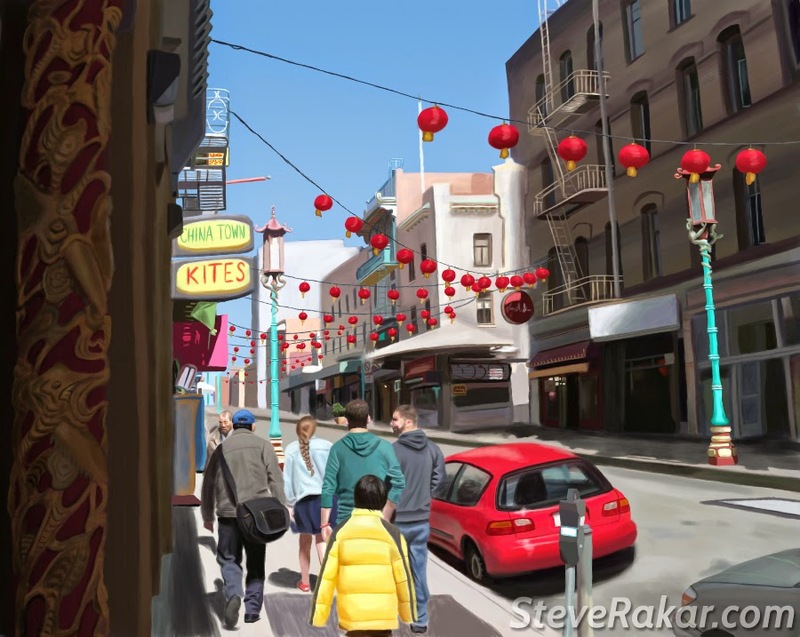 This is based on a scene I snapped in China Town on my last day in San Francisco. This was originally just going to be a quickie, but I decided to go all out with the detail so... Work in Progress! I'll show you the finished results next time! Until then... Adios! Hey guys! As I kinda mentioned last time, I'm going to GDC next week! It's my first time attending, and I'm super excited about all of the cool people I will hopefully meet there. I've been very hard at work trying to get Quest For Funk ready for the conference, and I'm happy to say that I will indeed have a playable prototype with me. I'll be wandering around the expo hall all week, so if you're attending, make sure to come say hello and give the game a try! Quite a bit has been done since the last update. The bulk of the time has been spent laying the groundwork for Stage 1 levels (the Twinstick Shooter portion of the game). As you may recall, Quest For Funk has 2 stages in each level: a Twinstick Shooter where you get points for every enemy you destroy, and a 2D Platformer where you must find all of the hidden NPCs before time runs out. The length of the timer in Stage 2 is determined by your score in Stage 1, so it's a continuing process. Everything I've shown off so far has been from Stage 2, so it's time I posted some Stage 1 images. Now this doesn't have any of the actual artwork in yet, because I've mostly been focusing on functionality. Twinstick control setups in Unity aren't as widely documented as a lot of other features (especially involving touch screens, but more on that later). So getting this part up and running was fairly time consuming, but it's pretty solid at this point. You move your character with the left stick (or WASD) and aim with the right stick (or the mouse). Firing happens automatically when the right stick is in a non-neutral position (or when the left mouse button is clicked). Right now you just shoot falling objects, but eventually you will face AI that shoots back and moves in more complex patterns. My goal for this prototype was simply to get the controls working correctly, and I'm happy to say that they are fully functional (with 3 different input methods, in fact!). Another big chunk of my time has been dedicated to implementing touch screen controls. This has been a very challenging task, but thanks to the amazing YouTuber Devin Curry, I've managed to get things working fairly decently. I created an omni-directional touchscreen joystick that behaves similarly to a physical one. Some actions are still a bit buggy using touchscreen commands however, so I plan to have a PS3 controller on-hand at GDC to ensure players can try the game with optimal controls. Aside from those two major tasks, the rest of my time has been spent adding polish and replacing anything that was still whiteboxed. There are now pipes all over the sewers so that every area is accessible. And the game now has fully functioning ladders! There are also crates to climb on! Because what kind of game would be complete without the good ol' wooden box? I've added in a few secret areas as well that give the player a reason to go off the beaten path. I'm a huge fan of hidden rooms and secret powerups, so I plan to include a lot of things like that in Quest For Funk. Now that the base of the prototype is solidifying, I should have some time to start adding in the fun stuff! Speaking of fun stuff, here's a bouncy collectible! These music notes serve a similar purpose to bananas in DKC or rings in Sonic. The more you collect, the higher your score is, but it's completely optional. I think it really adds something to the game when the player has an extra challenge to work towards. And since levels are timed in Quest For Funk, collecting all of the notes before time runs out could prove fairly difficult! And that's all I've got for ya this time! There are still a handful of items on my "To Do Before GDC" checklist, but I'm very happy with the state that the game is in right now. If you're going to the conference, get in touch. I'd love to meet you there! For everyone else, stay tuned. Some time in the near future I plan on releasing a playable prototype online. Until next time... Adios! Update #3: Lots of Background Art! Hey guys, it's been a busy two weeks! I've been hard at work on the game, and I've got quite a bit of new artwork to share with you. But first thing's first, you may notice a slight difference in the banner. After much deliberation, I've decided to change the title of the game. I was never fully satisfied with "Dyll's Quest For Funk." Having an apostrophe in the title seemed like it could eventually be problematic, and the name Dyll wasn't exactly interesting enough that it felt necessary to be in there. I thought about just calling it 'Quest For Funk' but a name that simple seems like it could eventually be a legal headache (especially with all of this candy nonsense going on right now). And so I finally settled on the title DJ Dyllusion: Quest For Funk. Let me know what you think about the new title in the comments section! I also went ahead and bought QuestForFunk.com so you can now access this blog from that address. Anyways, without further ado... let's get to the new art! This is the first building that you enter in the game. A lot of platformers have that flat look where you're standing on boxes directly in front of the camera, with a 100% straight view (original Mario or Sonic games for example). I wanted to go with a visual style with a bit more depth, like something that you'd see in a fighting game or beat 'em up. While the character is still limited to two-dimensional movement, the background gives the illusion that it takes place in a world with three dimensions. When you're up on the streets, it's a wide open area with scrolling backgrounds and expansive landscapes. But once you go down into the sewers, the area becomes much more confined. The backgrounds down there become static and give you a sense that the character is in a tighter place.I really want to convey a sense of depth with my environments. These backgrounds are actually composed of many small, individual pieces that are designed to be modular. Placing them in Unity has turned out to be a bit more time consuming than I originally figured it would, but by creating them in such a way it gives me a lot more freedom in my game design. I've toyed with the idea of creating more of a grid-based tile system to make placement easier. But again, I think the sense of scale that I'm currently using provides greater creative freedom than if I was working with tiles. So I'll stick with my current methods, at least for the prototype. 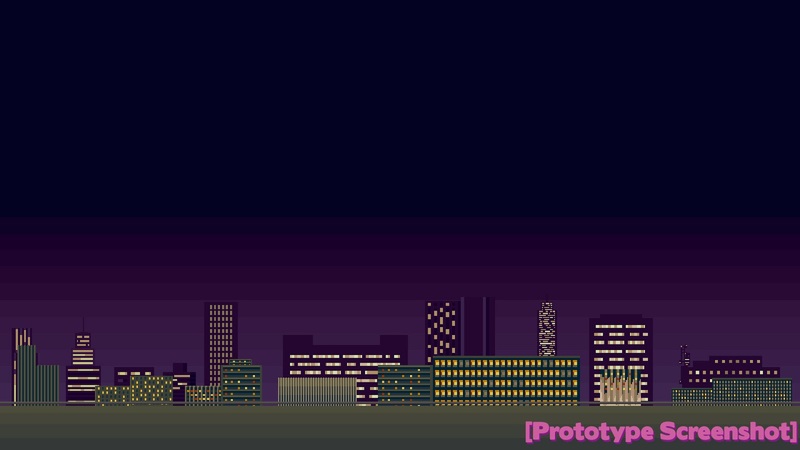 Here's a view of the skyline background. This is actually 4 images on top of one another, each able to scroll at its own speed. I went ahead and completely re-wrote my parallax script to not only be more efficient, but also to give me a bit more control over it from within Unity. I still have a slight issue with some of the layers fighting for Z-space, but I'm sure I'll figure that bug out before the next update. I also plan to add some clouds and stars up in the sky to break up that big dark area. As you may have noticed up above, I finished Dyll's jogging animation! I've included the two sketched versions for comparison. I think I may need to adjust his head a bit in this animation to prevent it from looking so stiff, but I'm certainly happy enough with it for the prototype. This actually took me quite a bit of time, so I feel a slight sense of dread when I look at my list of animations that still need to be done. Hopefully the experience I gained from this one can help to speed up my process a bit. Lastly we have my favorite bit that I worked on recently - a city bus! This is simply there as an "invisible wall" on the left to prevent the character from going off the map, but I got a bit carried away and had too much fun with it. Eventually I'd like to start the game off with an animation of Dyll getting off the bus and walking into the level. And then maybe looping an animation of the bus driver opening and closing the door. To me, little things like that really push sprite based games over the edge, so I'd like to include as many subtle animations as I can in the backgrounds. And that's pretty much it for now! I feel happy with what I've accomplished since the last update, but of course there's still tons of stuff to do! I'm hoping to have a somewhat polished and playable first level when I head off to GDC in a few weeks, so look forward to at least one more update before then. Until next time... Adios! It's been a little while since the last post. I think it's time to talk about the progress I've made on Dyll's Quest the past few weeks. To all of you who just like looking at pretty pictures, sorry to disappoint! You might want to skip this post since almost all of the recent progress has been on the coding side of things. So here's what the prototype looks like in it's current state. None of those assets are finished, but it should give a pretty good representation of the direction for this game. I've recently added a lot of functionality into gameplay scripts. I added a HUD script that keeps track of various statistics. I coded a parallax background script that allows multiple background planes to scroll at different speeds when the player walks. 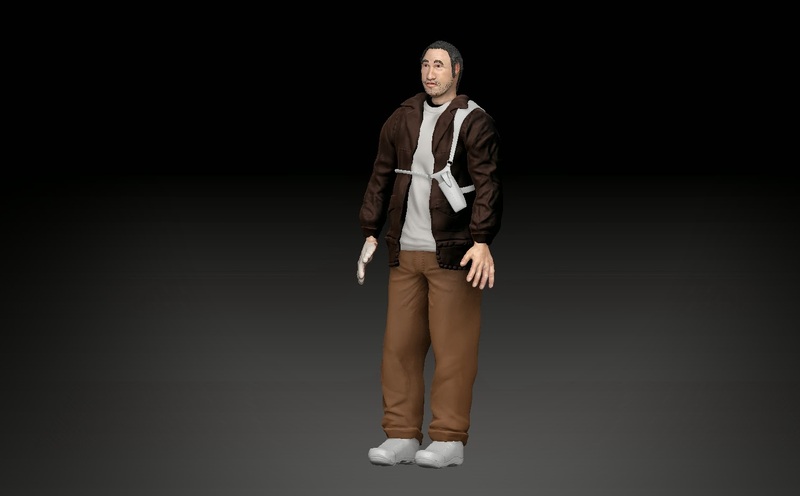 I added functionality for Dyll's 'Get Down' move, which allows him to use his Funk powers on NPCs. Speaking of NPCs, I've spent a lot of time coding enemy AI since the last update. The default Hobo enemy can patrol an area, idle, jump, die, chase the player and return to a home position. He's not all that intelligent yet, but as an artist first and a coder second, I'm pretty proud of what I've accomplished on him so far. I've also implemented a basic pause menu, and fixed a subsequent bug that allowed the player to rocket jump while pressing the jump key on the pause screen. (It's a feature, not a bug!) A countdown timer is now also in place, and you'll be taken to a game over screen when time runs out. 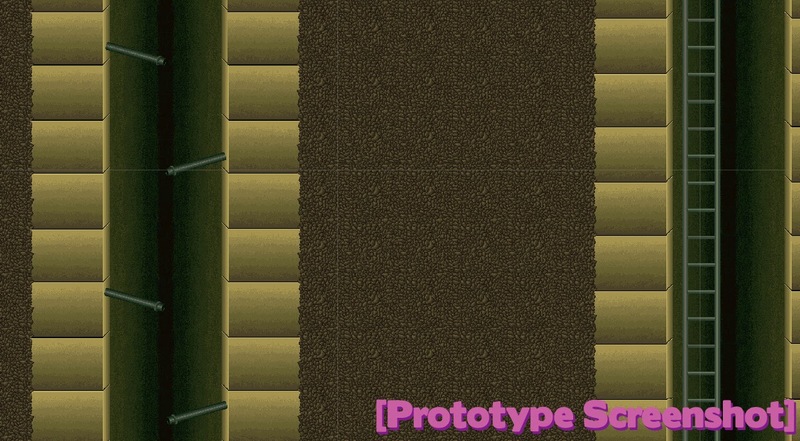 I've also created a ladder script so that climbable objects are now fully functional. Things are moving along pretty well. I'm getting to a point where most of the basic gameplay elements are in place (at least for the prototype), so I can finally start concentrating on the art assets! That said, expect the next update to be a bit more visually appealing. Until next time... Adios! Well I've been putting this off for a while, but I think it's time I made my post on the recent 3D work I've been doing. In addition to the various freelance jobs I've recently been involved in, I've been busy improving my 3D skills for my portfolio. Some of these projects are more finished than others, but here's the result of the past few months of work. Steve Rakar - Title Logo from Steve Rakar on Vimeo. Another spontaneous project that I completed last weekend was this render of a soup can. Most of my texture creation lately has been digitally painted and slightly more light-hearted. So I figured I'd put together something a bit more realistic. Not sure I quite captured the dark visuals that I was intending, but I like the results nonetheless. Speaking of light-hearted texturing, here is a cartoony lighthouse I finished a few weeks ago. I based it on a real place in Alaska called the Salty Dawg. I finished this one a long time ago, so I had to double check to make sure I hadn't already posted it. This was originally a texture that I created for a pop machine in our senior studio game, Aliens in Eden. The original model was kind of bland but I liked the texture, so I decided to re-purpose it as a mockup marketing ad. This was back when I was studying a lot of rendering tutorials so I learned quite a bit about MentalRay while working on this one. This is a tribute to my old car that I ended up leaving behind in Chicago (RIP ;_;) The previous car models that I had in my portfolio were way outdated (like 2nd semester of 3D classes outdated), so it was time for a replacement. I figured what better car to model than the first one I ever owned, so here is my now deceased Chevy Prizm. And now to the less finished stuff. This is a character named Montez for an animation short I planned a while back. Here is some of the concept work I did for him nearly a year ago alongside a preliminary face render. Still have some work to do to better capture his likeness. I had used ZBrush quite a bit before this, but this project was where I really got hands-on with the workflow and a bunch of the more advanced tools. I learned a lot about sub-tools and ZAppLink from this. I still haven't quite finished texturing his body and adding in all of the fine details, but hopefully I'll find some time to get back to this project soon. 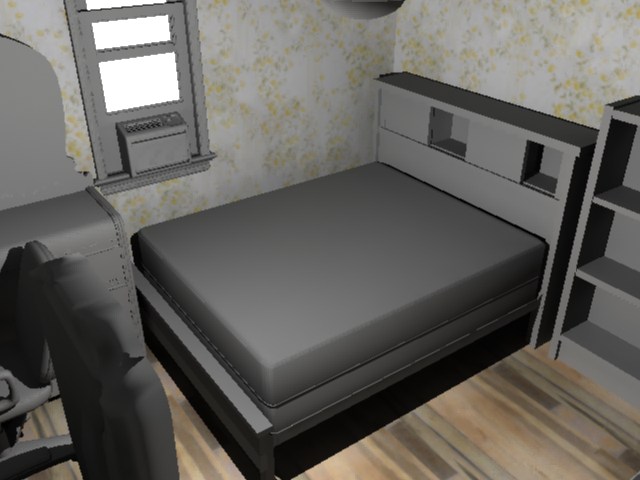 Another ambitious project that I started this past Fall was re-creating my bedroom in Maya. So far I've managed to model all of the big pieces, but it still has a long way to go before it's at the level I'm looking for. I absolutely love UVing and texturing, but with the amount of small objects in my room... it's a liiittle bit time consuming. I'd very much like to have a finished, realistically-populated environment in my portfolio though, so I definitely plan to get back to this one when I've got some time. And that pretty much concludes this update. I do have a bunch of really nice renders from the freelance job I'm currently working on, but I'm going to hold off on posting any of that until the job is complete. Anyways, thanks for checking out my update. I love getting feedback on my work, so don't be shy! Until next time... Adios! Hey guys! 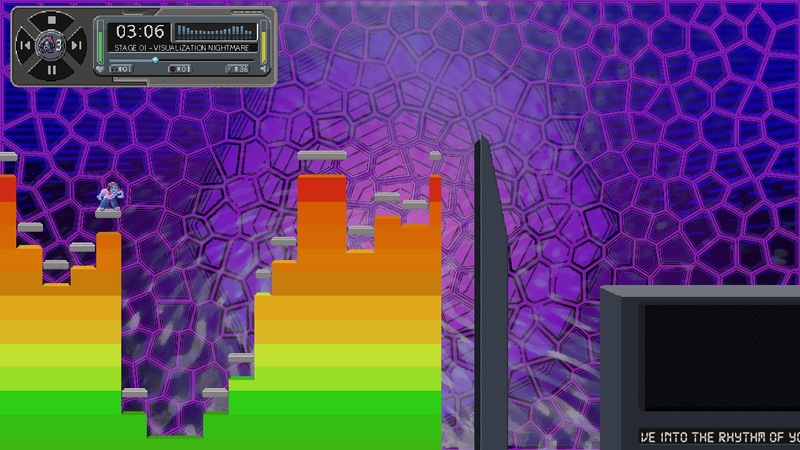 Welcome to the first blog post about my new game, Dyll's Quest for Funk. 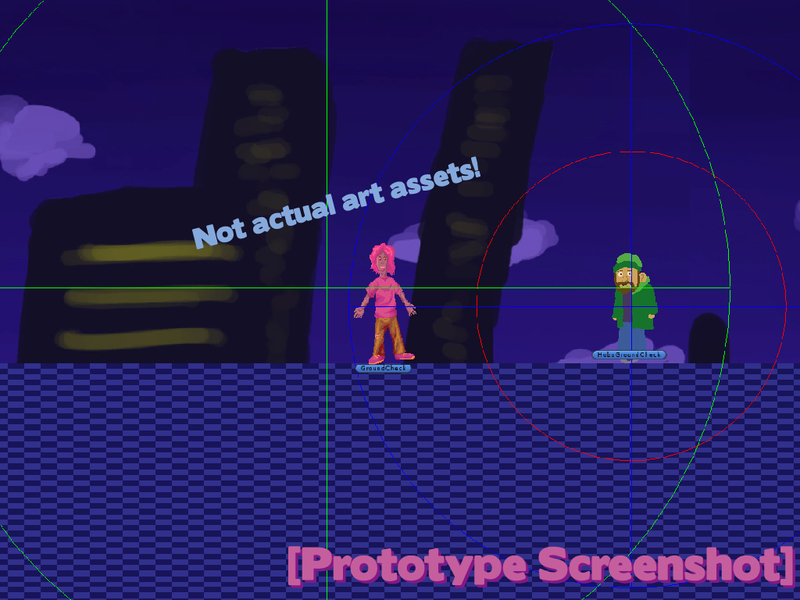 In this blog I will take you behind the scenes and share all sorts of neat little tidbits about the game development process. 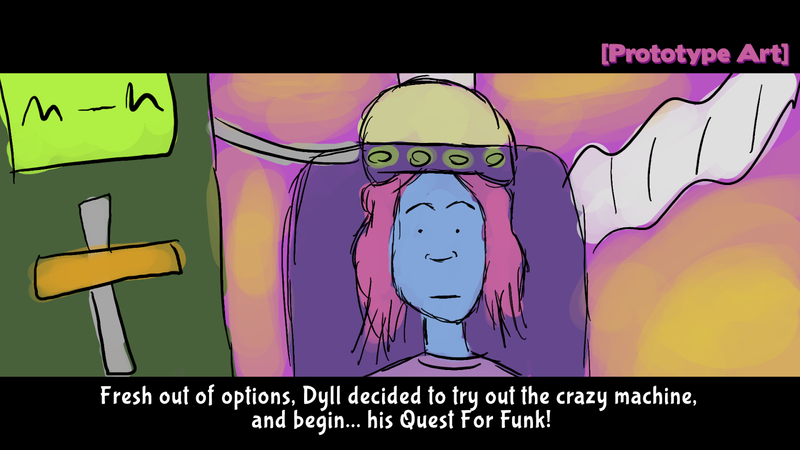 Dyll's Quest for Funk is an idea I've had for a while now. I spent a few months nailing down the concept and writing out the design document. And recently I began to work on the prototype. This is my first time ever writing a blog about game development, and this is your first time ever reading a blog about my game. So it'll be a learning experience for all of us! I want to give you an interesting look behind the scenes as I develop Dyll's Quest, but at the same time I don't want to reveal too much information too early. So these first couple posts will be about finding that right balance. I'll discuss the details of the gameplay a bit more in a future post. For now though, I'll give you a rundown of the basics. Dyll's Quest actually has two distinct gameplay styles: part 2D platformer, part twinstick shooter. Your progress in one portion of the game directly impacts the other half. You need to continuously build upon the momentum of the previous level to succeed in the next stage. As I mentioned, I just recently started to really get working on the prototype, so the game is still in the very early stages. Most of the artwork and screenshots that I post now will likely look completely different by the time the game is finally released. Keeping that in mind, let's take a look at some pictures. 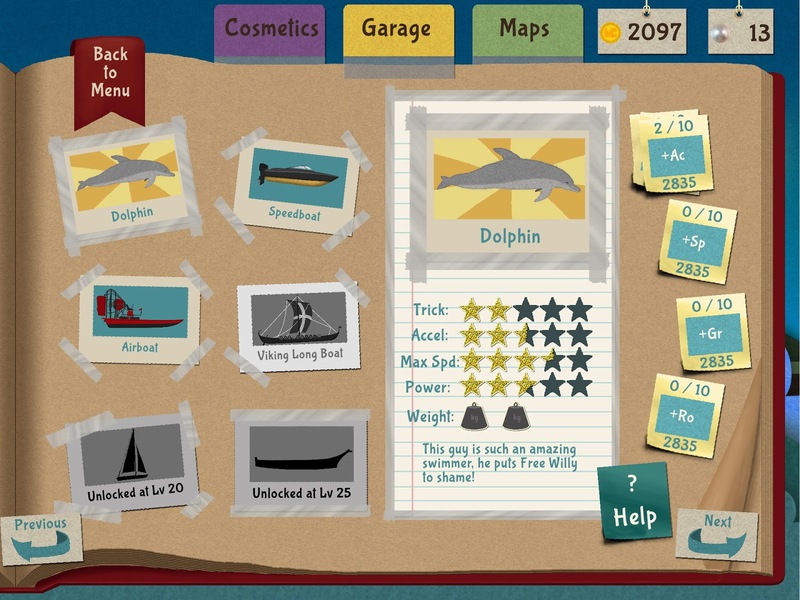 This is an early concept piece of the UI. Originally intended to be a sample mockup for my portfolio, this picture actually spawned the idea for the game. While I'm going for a rather over-the-top style with the art direction in this game, I want to make sure that things are also functional. Readability is an important aspect of a good UI, so some tweaking may still be in order. Some of the media player elements will likely remain for the final design, but there will need to be a few changes. Still frame of the main character, Dyll. 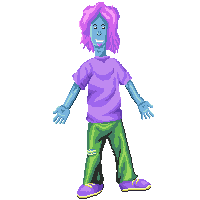 This was more for establishing proportions and a color palette, but this sprite may find it's way into the game in some form. Dyll is sort of a laid-back, hippy kind of fella. 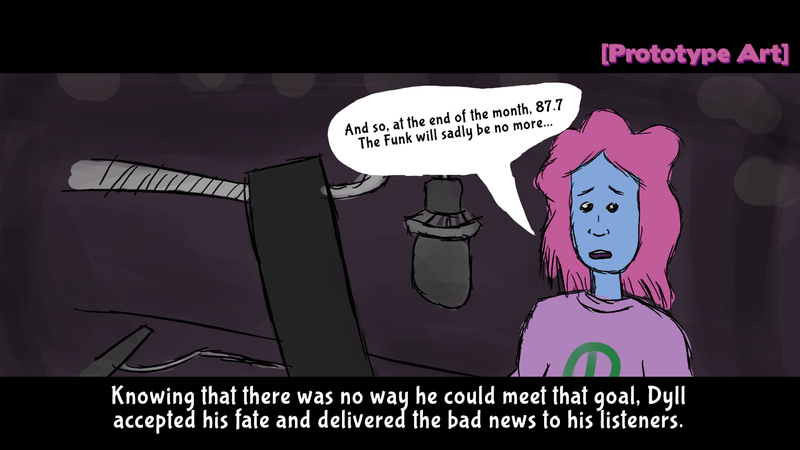 He runs a relatively unknown radio station, so I'm trying to convey the type of character that you'd imagine DJing amateur radio in the middle of the night. He's quirky, he's funky, but he has a very optimistic outlook on life. Dyll's jogging animation in progress. First I start with the sketch, then I fill in the base colors. Next comes the details and the shading. 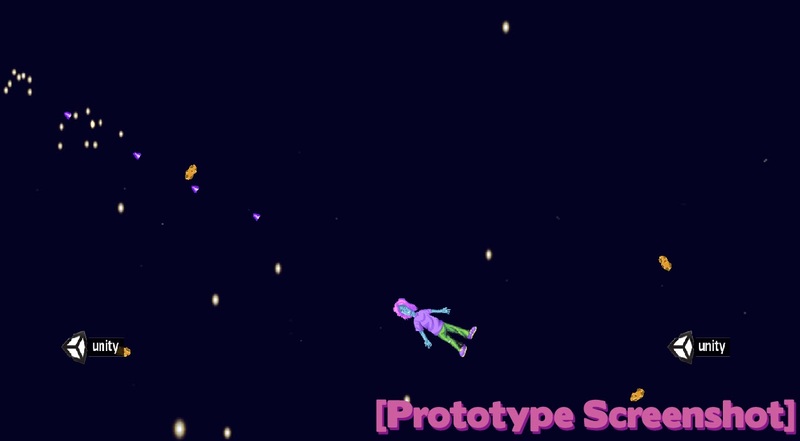 Last, we have a screenshot of the prototype working in Unity. Beautiful, isn't it? I've managed to white-box the first level (or in this case, I guess blue-checker-box would be a more correct term). In addition we have the player character (in all his unfinished glory) running and jumping around the level for testing purposes. It may not look like much from this shot, but this is actually hours and hours of work that have laid down the foundations for the final game. Well, that's about it for now. A lot of the basic functionality is actually done, so hopefully we'll see a lot of art posts in the near future. I will continue to update this blog as I make more progress on the game. I hope this was interesting to everyone. If you have any comments, questions, or suggestions, feel free to leave them below. Until next time... Adios! I know I said my next post would be about my recent 3D work, but I just want to sneak this one in here before I get to that. First off, The Amazing Jungle Rescue has been published on Indie City! It's not the most well known game distributor, but it's a great website and it's very easy to use. We're still exploring other distribution options as well, in order to get the game in the hands of as many people as possible. (If you're associated with such a game distribution platform and you're looking for family friendly puzzle games for your storefront, please don't hesitate to get in touch!) Anyways, we're excited that others can finally play our game, so please check it out at the link below or on our website: HyraxGames.com. The game is $3, and there is a free demo as well in case you want to try it out before you buy it. As usual, thanks for reading. I promise my next post will be the one on 3D art that I mentioned. Adios!